With six Emmy and four Tony nominations to his credit, Victor Garber has been seen in some of the most memorable works of film, television, and stage. Garber co-starred in Ben Affleck’s Academy Award-winning film, Argo. He also portrayed San Francisco Mayor George Moscone in Gus Van Sant’s Academy Award nominated film Milk. Additional film credits include The First Wives Club, Sleepless in Seattle, Legally Blonde, and the Academy Award-winning film, Titanic. Recently, Victor has been seen co-starring with Ryan Reynolds in Self-Less, with Emily Blunt in Sicario, and Samuel L Jackson in Big Game. For his work on television, Garber has been nominated for six Emmy Awards, including three for the ABC drama Alias, two for comedic guest-star roles on Frasier and Will & Grace, and a nomination for his portrayal of Sid Luft in the television movie Life with Judy Garland: Me and My Shadows. Garber also starred in NBC’s drama Deception as Robert Bowers, the patriarch of the Bowers family and CEO of Bowers Pharmaceuticals. He currently recurs on Power on Starz, The Flash on CW, and has guest starred on Showtime’s Lisa Kudrow comedy, Web Therapy, The Big C, Nurse Jackie, Damages, and Glee and starred in ABC’s Eli Stone, and Justice on Fox. Other credits include ABC musicals Annie Rodgers and Hammerstein’s Cinderella, and Meredith Willson’s The Music Man. Garber’s earned four Tony nominations for his work in Damn Yankees, Lend Me a Tenor, Deathtrap, and Little Me. He performed in the workshops of Sondheim’s Assassins and Wiseguys as well as in the Tony Award winning play Art. His stage credits also include the original Broadway productions of Arcadia, The Devil’s Disciple, Noises Off, and Sweeney Todd. Additionally, Garber garnered rave reviews in Sondheim’s Follies for City Center Encores! And most recently, Present Laughter, directed by Nicholas Martin. 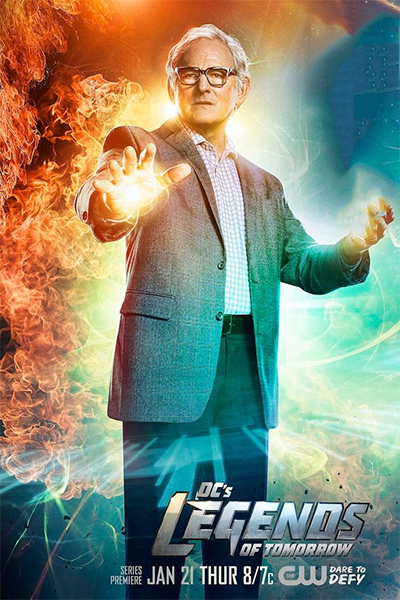 Garber can currently be seen starring in the new CW spin-off, Legends of Tomorrow. He will be appearing Friday through Sunday.